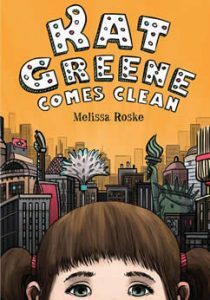 Today I’m shining the Author Spotlight on Melissa Roske and her debut novel KAT GREENE COMES CLEAN. Eleven-year-old Kat Greene has a lot on her pre-rinsed plate, thanks to her divorced mom’s obsession with cleaning. When Mom isn’t scrubbing every inch of their Greenwich Village apartment, she’s boiling the silverware or checking Kat’s sheets for bedbugs. Add friendship troubles to the mix, a crummy role in the school play, and Mom’s decision to try out for Clean Sweep, a TV game show about cleaning, and what’ve you got? More trouble than Kat can handle—at least without a little help from her friends. I first got the idea from a fortune cookie. It said, “A winsome smile is your sure protection.” I wasn’t sure what it meant quite honestly, but I liked the sentiment. So I started freewriting, and Kat Greene – a smart, kind, funny 11-year-old – popped out! In terms of the mom’s character, that is more complicated. As you know from reading the book (thanks, Trish! J), Kat’s mom suffers from a cleaning compulsion—a symptom of her OCD. She’s also afraid of germs and contamination. It wasn’t until I was done writing the book that I realized that the mom is actually based on my dad. It honestly hadn’t occurred to me, at least on a conscious level. My dad, however, is the opposite of Kat’s mom. He is extremely messy and keeps everything. I actually found a datebook in his apartment from 1973! He also hasn’t been diagnosed with OCD, although his behavior certainly points to it. He’s a checker, for instance, which means he can’t sleep until he’s checked the front-door locks at least three times. I too have some OCD symptoms, including the need to have my window shades fixed at a certain level, but I wouldn’t say they adversely affect my life. They’re just annoying—to my family, and to myself. I try to write every day, even if it’s for 15 minutes. That’s not to say I actually do it, but the operative word is try! I also like to do a little prewriting before I sit down to work. I have a special journal for this purpose, and I use it to test out ideas, explore plot points, and to ask myself plenty of “What if” questions. For instance, there’s a scene in my book where Halle is blabbing on and on about her crush, Michael McGraw. I wasn’t sure how Kat should react, so I asked myself: “What if Kat told Halle to put a lid on it?” From there, the scene developed fluidly. Also, I don’t work from an outline, but I do write a synopsis before I tackle a project. I like to have a roadmap, even if I don’t follow it. It keeps me focused, and on track. In terms of research, I had to do quite a lot, because I wanted to make sure that the mom’s OCD was portrayed fairly and accurately. 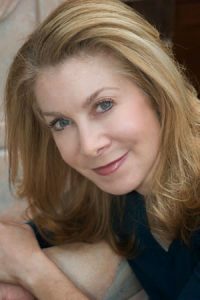 Therefore, I read many books on the subject—including Traci Foust’s excellent Nowhere Near Normal: A Memoir of OCD—and I interviewed psychologists and psychiatrists. I wanted to be respectful of those who suffer from this disorder, as well as family members who suffer as a result. I can’t choose one teacher because there were so many (! ), but I can say that my love of writing was definitely nurtured and encouraged by my teachers at the City and Country School, the century-old progressive school, in New York’s Greenwich Village, on which Kat’s school is loosely based. City and Country taught me to think outside the box, and to work independently. We didn’t have homework, or tests, or grades—yet we managed to “learn by doing,” the guiding principle of the school, coined by C&C’s visionary founder, educator Caroline Pratt. I think KAT works well in a classroom, because most of the action takes place in the classroom—namely, the Village Humanity School, Kat’s ultra-progressive elementary school. That’s not to say that Kat’s classroom experience will mirror that of a more traditional classroom, but there are certain themes that are universal: coping with conflict; working out differences; respecting others; kindness. I am a huge fan of my friend Irene’s bulldog, Bo Hwang. He has a sweet disposition, a cute wrinkly face, and a fierce sense of style. He has his own Facebook page too.